Kmart Black Friday Ad 2017!! 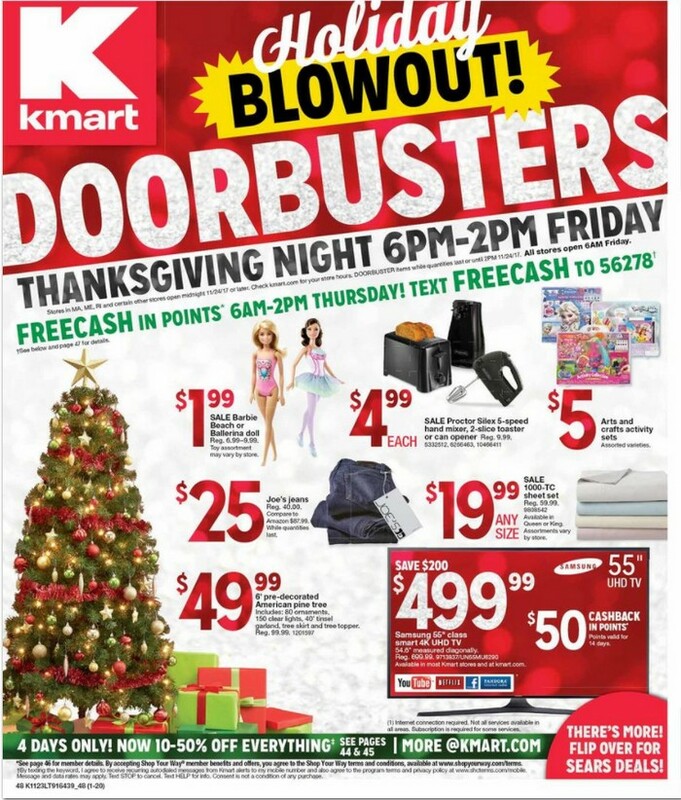 KMART Black Friday Ad 2017 – Full Ad Scan! 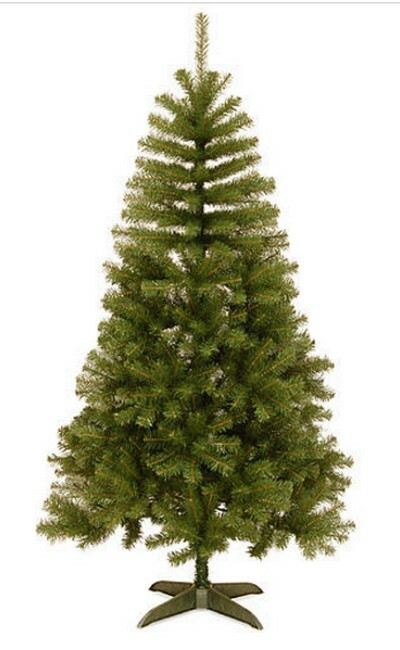 Hurry over to Kmart.com where you can snag this Trim A Home® 6′ Alpine Spruce Tree ONLY $19.99 (reg. $49.99!!). 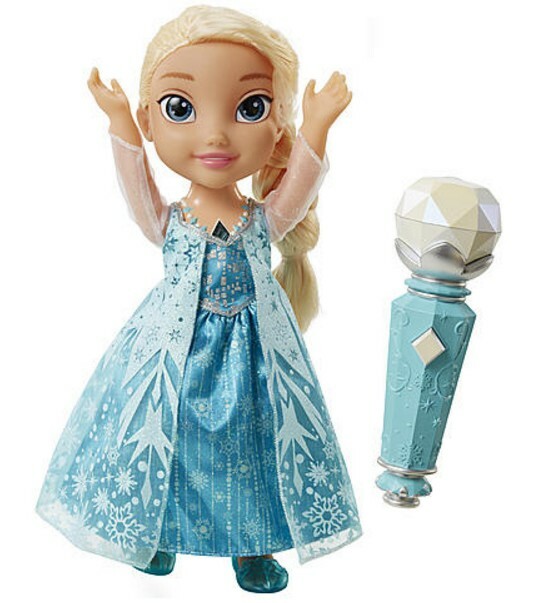 Plus if you are a shop your way member, you will also get back $0.40 to use later, thus making this ONLY $19.59!! The 6′ Unlit Alpine Spruce Artificial Christmas Tree is a simply perfect addition to any holiday display. At a manageable 6′ tall and with a base diameter of 41″, you’ll be able to easily fit this Christmas tree into tight corners of your house or apartment without having to re-arrange your furniture. Even small kids will be able to easily help out in placing their favorite ornaments on the 648 branch tips to fill out the tree. This artificial tree comes in 2 sections for a quick assembly, and comes with a reusable container for convenient storage when Christmas is over. A slim 41″ base diameter will allow you to place your tree in tight areas of your home without taking over living spaces. The Disney Frozen 3-Wheel Scooter is designed for durability and ready for sidewalk fun. The handlebar features a Princess foam pad and roomy round bag. The scooter deck features a non-slip surface and is decorated with your favorite Disney Princess characters.. Handlebar height easily adjusts. Resin mag wheels with PVC tires. Recommended Age: 3+. Thru 11/28 at Kmart.com you can snag these 50 x 60 Fleece Cannon Throws. Be sure to choose in-store pickup I have purchased several of these to hand out to our homeless friends!! 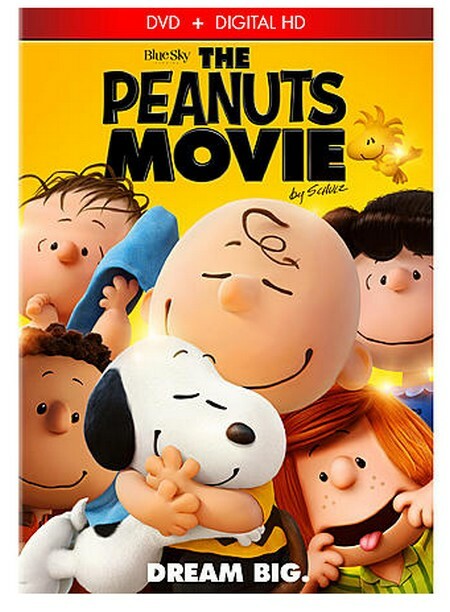 They are on sale for $1.99 (reg. $7.99), but if you are a Shop Your Way Rewards Card Holder you will receive 500 points ($5) when you make a $5 purchase. This means you can snag 3 of them for ONLY $0.32 each. Final Price: $0.97 for all 3 or JUST $0.32 each wyb 3!! 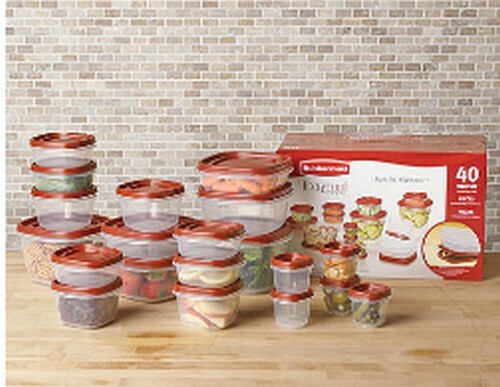 Enjoy being organized and knowing that you have lids to match your containers with this Rubbermaid easy find lids 40-pc. storage set. It’s easy to know where your lids are because you have two choices: You can attach all the same size lids together for neat storage, or you can attach the lids to the base of the container for a super easy solution to keeping your lids and your bases organized. This amazing 40-pc. Rubbermaid storage set includes the following containers: 5 1/2-cup, 5 1/4-cup, 4 2-cup, 2 3-cup, 2 5-cup and 2 7-cup containers with matching lids. These containers are graduated in size, so they nest together for compact storage. You can choose which way you want to store the lids, either snapped neatly together, or you can opt for snapping them on to the base of the storage container. KMART: Cannon Fleece Throws ONLY $1.99!! 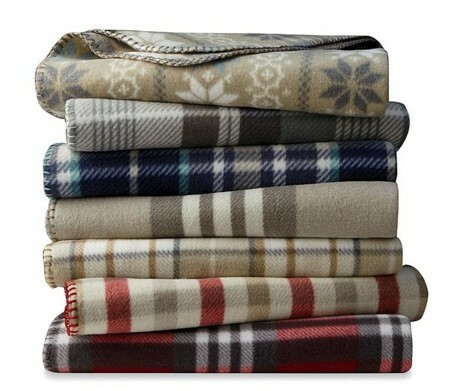 Thru 11/26 at Kmart.com you can snag these 50 x 60 Fleece Cannon Throws. I have purchased several of these to hand out to our homeless friends!! 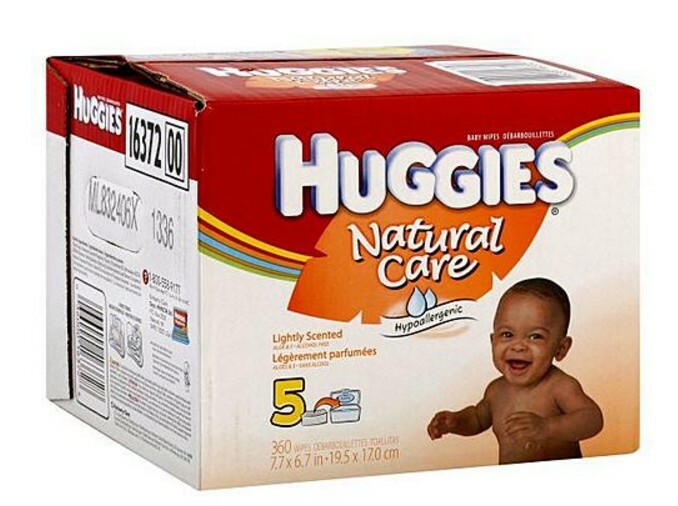 Hurry over to Kmart.com where you can snag these Huggies Natural Care Baby Wipes, Light Scented 360 wipes ONLY $6 (reg. $10.99!!). 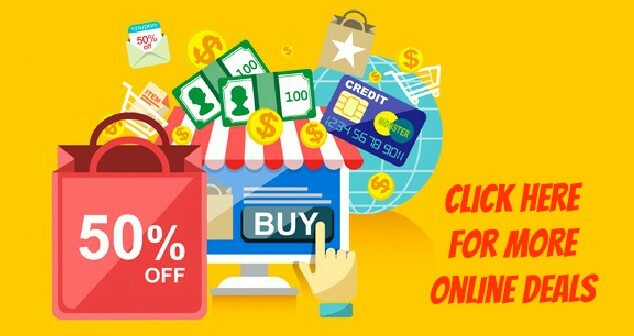 Plus if you are a shop your way customer, you will earn $0.60 back so making them ONLY $5.40. Great price and a great donation item to a local pregnancy center. 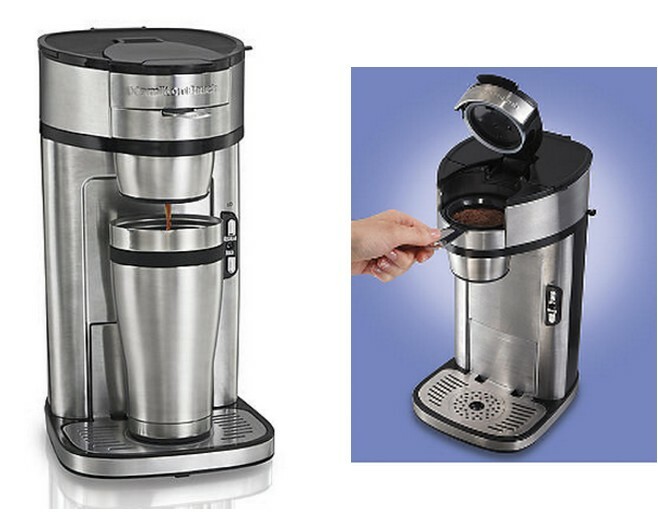 Get coffee that’s as personal as your distinct taste with The Scoop™ Single-Serve Coffeemaker. Each cup is made fresh and flavorful just the way you like it. You can make just the amount you want getting a perfect cup every time without spending much more on expensive brands. Purposefully called The Scoop, the unique single-serve coffeemaker lets you simply scoop your preferred ground coffee, add water, and brew in its single serve scoop filter without any extra steps. It lets you brew 8 to 14 ounces conveniently to fit into your travel cup or coffee mug making it perfect for when you’re on the go.